A nursing home aide from Africa, an actor from Colombia, a U.S. Navy veteran from Chicago, and a physician from Guatemala. While appearing so different at first glance, they have a horrific experience in common: They have all been tortured. With a quiet, insisting voice, Beneath the Blindfold follows four torture survivors as they struggle through the daunting steps of rebuilding their lives. 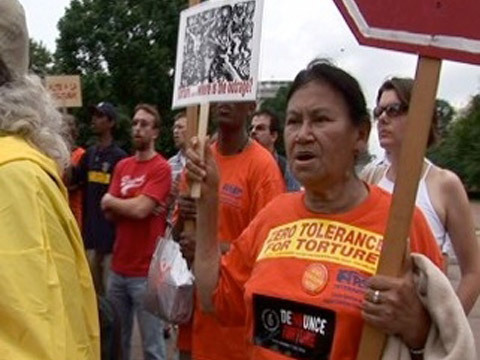 The first documentary to focus on the debilitating, lifelong consequences of torture, it adds an important perspective to the continued debate in the United States of America about government-sanctioned torture. Beneath the Blindfold sensitively paints a holistic portrait of the survivors’ experiences, their path to healing and life after torture. Ines Sommer shoots documentaries for other filmmakers and produces and shoots videos for nonprofit organizations. Ines Sommer received a Casey Medal for Meritorious Journalism for her camera work on Daniel Alpert’s A Doula Story: On the Frontlines of Teen Pregnancy, and she shared cinematography credits on two recent documentaries by Chicago's legendary Kartemquin Films: Maria Finitzo’s Peabody Award-winning Mapping Stem Cell Research: Terra Incognita and Joanna Rudnick's Emmy Award-nominated In the Family. In late 2008, Ines co-founded Percolator Films, a nonprofit film organization that presents independent films in the Chicago area. Among Percolator Films' current programs are the free, community-based Reeltime documentary and discussion series in Evanston, Illinois and the annual Talking Pictures Festival. Kathy Berger co-founded the Talking Pictures Festival with Ines Sommer, and she is currently on the Festival Committee. She also is one of the founders of the Reeltime film discussion series, held in Evanston, Illinois. Ines Sommer later joined her as a co-director of the program.